early as Monday, April 29. Welcome to Bradford Exchange Checks, where our personal checks and services can be a perfect expression of your style! It's quick and easy to securely order checks and other accessories from Bradford Exchange Checks, so see first hand how much you can save - up to 70% off bank check prices! With our unique selection of personal checks with style, you will find the design that perfectly reflects your taste. From classic business checks that celebrate professionalism to eye-catching bank checks that add an extra pop of color to every day - and everything in between - Bradford Exchange Checks is the premier source for cheap checks and checkbook covers, all at a super value! Love the inspiring artwork of Thomas Kinkade? Or perhaps your favorite dog breed is what puts a smile on your face. Whatever interests you, our ever-expanding selection of personal checks showcase stylish tributes to what you love. And when you shop online at Bradford Exchange Checks, you'll see that most of our check designs have checkbook covers and address labels that perfectly coordinate! Stick to one theme or mix and match to showcase a variety of your interests! 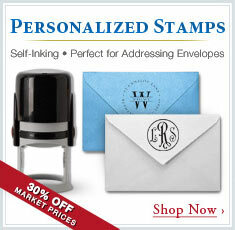 Plus, we now offer a line of personalized stamps and accessories featuring over 180 new products, including custom rubber stamps, Peel & Stick stamp sets, tools and more, all at an everyday savings of 30%. You can always rest assured that when you order checks from Bradford Exchange Checks, they will exceed bank security standards. Our vast carousel of checks meet all requirements established by the American National Standards Institute (ANSI), and will always be fully accepted at your financial institution. Plus, you can always shop with trust and confidence when you secure the additional benefit of services like EZShield® and EZShield PRO®. We also offer the convenience of SecureShip®, providing fast, trackable and guaranteed secure delivery. Bradford Exchange Checks are the perfect expression of your unique style, ranging from contemporary to classic, and from elegantly simple to playfully bold. Lena Liu checks that capture the beauty of nature, Disney checks to enchant and delight, MLB® checks and college checks to show your team pride, charity and causes checks to reflect what you hold close to your heart - they're all here waiting to be discovered by you! We've made it simple to safely and securely order unlimited checks online and quickly receive your checks in the mail, so don't wait. Shop Now!